The Ordinary has been all over my social media feeds lately. Everywhere I look, I see someone raving about the brand and how they've created brilliant skincare with an affordable price tag to match. It's taken me a while, but I've finally got my hands on some goodies. 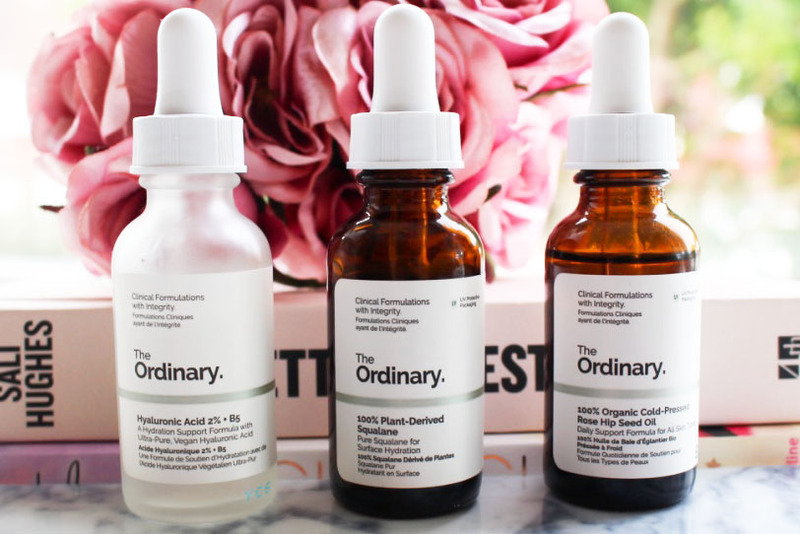 Being a big fan of the Trilogy Rosehip Oil, I was really intrigued by The Ordinary's offering. They are exactly the same, but for a fraction of the price. The texture is the same, the smell is the same and the results are the same. If you removed the labels, you wouldn't be able to tell which one cost £35 and which one cost £9. I won't lie to you, I have no idea what Squalane is. I hadn't even heard of it until I bought this. But my oh my is it good. I've been using this for a good couple of months now and my skin just loves it. It's a clear oil that's non greasy and really fluid. It gets absorbed straight away, but not in a 'need to apply more within minutes' kind of way. Two drops is enough for my face and I just love the way it feels. It's so good, I've been neglecting my higher end serums and oils. I've also been applying a couple of drops on my elbows and it's completely hydrated those pesky dry patches. I think I'm in love. With Hyaluronic Acid. We've been together for a while now and I can see myself settling down with it. My skin started feeling horrible around August. The weather changed and so my skin went from being relatively normal, to dry as a bone. Slight exaggeration, but moving on. I've been forgoing my usual Vichy serum as it was just too light and went straight for the hard stuff. My goodness this is good. Two to three drops of this really hydrates and plumps the skin. It's got a nice tackiness to it so whatever you put on top, sticks to it and works that much better. So far, The Ordinary is anything but ordinary. Sorry I had to! Corny jokes aside, I'm so impressed with what I've used so far. Finally a brand offering decent skincare for a very reasonable price. I've already purchased the Salicylic Acid and will be reviewing that soon, but next on my list is the Glycolic Acid toner. I'm keen to see how that compares to Pixi Glow Tonic. What's your favourite product from The Ordinary?